So Hay Festival this year was splendid. The hour long scenic bus route was wonderful and I got chatting to some local attendees during the bus ride and I got to sit on the front seats at the top of the double-decker bus; feeling like a carefree girl of five! The ride was swift and soon I had arrived on the Welsh-English border town of Hay-on-Wye. return bus fare only a tenner. 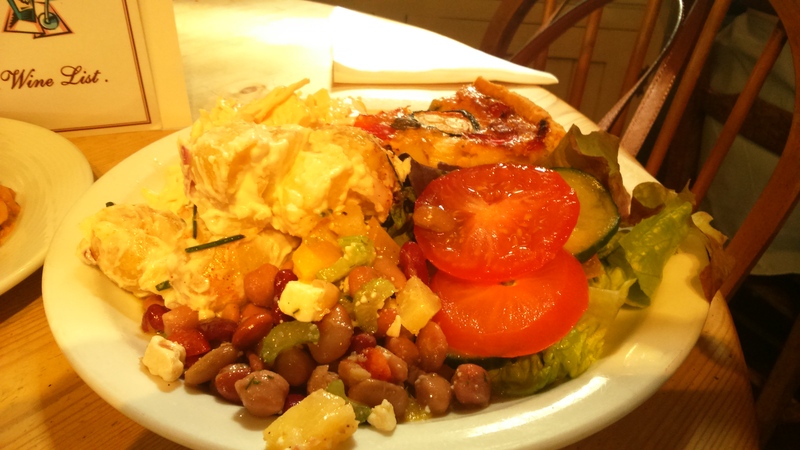 Whilst wandering the small streets of Hay it appears most of the places to eat serve soups, panini’s, cakes and good old-fashioned British comfort food. 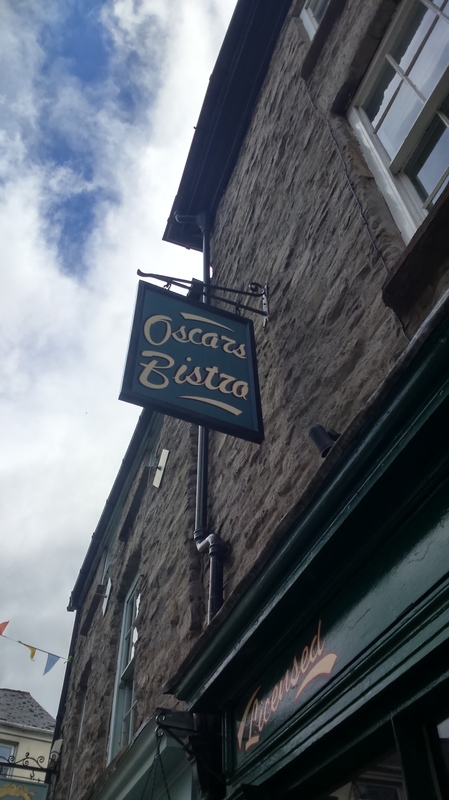 Oscar’s Bistro took cash and card payment and as I am notoriously hopeless at carrying cash this made it an ideal choice. I was not disappointed. Although quite small there is seating upstairs and downstairs with tales for x4 people at a time plus couple seats outside. Although I was travelling alone you’d think by the amount of food I ordered I had little urchins to feed! The servings are gigantic compared to other British café’s! 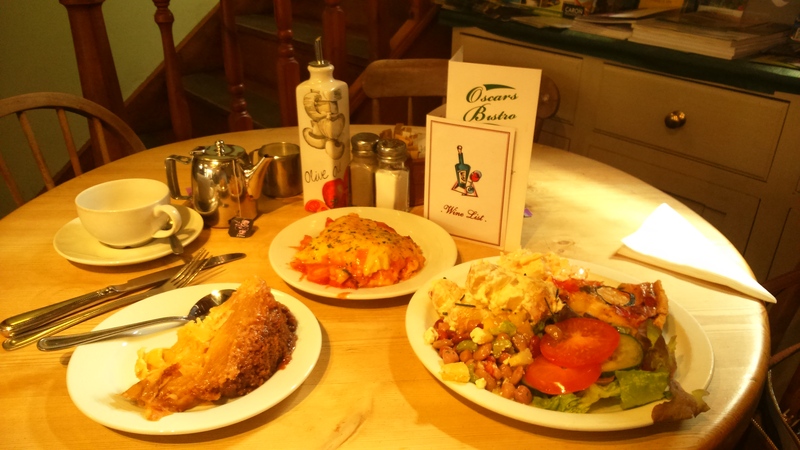 On the top-right we have a £9 plate of a veggie quiche, salad, lentil/bean salad and boiled potatoes drenched in salad cream-a little too much for my liking in terms of cream…And oh yes there was coleslaw too. Great value and superb taste! I really enjoyed it and took bites of the veggie lasagne which is the centre plate dish. I was having a carbalicious feast. I was majorly overdosing on carbs like a famished soul! I’m sure other diners were looking at me like I was Little Miss Glutton! It was so worth it. I absolutely want to return. The generous servings make you feel spoilt like Royalty and the taste of the dishes are flavoursome the only thing that irked me is the excessive salad cream in the new potatoes and coleslaw. This was washed down with Earl Grey-disappointingly only two small saucer cups worth of tea. Then came the cinnamon-spiced apple cake. More apple slices than pastry but a perfectly sweet and crisp appley goodness taste. I would absolutely return and eat myself to carb oblivion. 8/10. 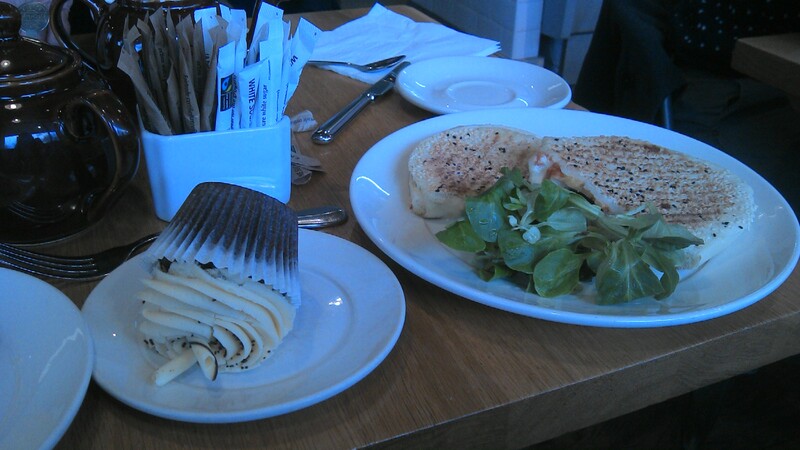 Review: The Swallow Bakery, Cheltenham. My first visit to the Swallow Bakery was back in 2012, whilst working at The Times Cheltenham literature festival (in the kids tent), and en route to the train station homeward bound, decided to stop by because it was right next to the festival tents. In a rush I grabbed a cupcake which was so scrumptious with a generous serving of icing, I knew I would have to comeback again. Cut to December 2014 and beyond I throughly enjoy returning because the cakes are THAT good. Above on the left is the three-tiered lemon cake. As you can see there is luscious, thickly spread icing between the beautifully moist sponges and very tasty icing on top and a squiggle of cream! Indulgent and satisfyingly creamy. Not the place to go when you’re on a diet! The slices are gigantic! You definitely receive generous, dreamy servings in this bakery. First I ate the panini on the far right . It is a delicious, can’t-go-wrong: chicken, mozzarella and pesto filling. All good and served hot. This savory sandwich was followed by the lemon cake and Bailey’s cupcake eaten in alternating intervals of the cakes; per two bites. 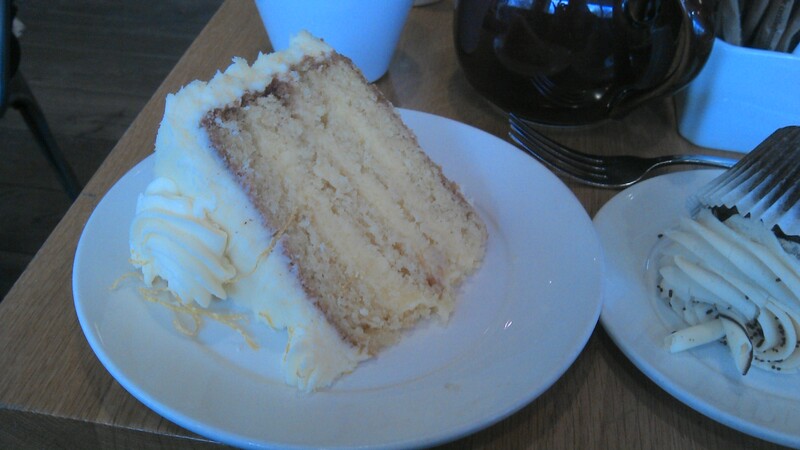 My taste buds relished the juxtaposing rich, creamy lemon cake followed by bites of the chocolately cupcake. Yes I am indulgent like that! Greedier than Nigella Lawson! The icing tasted of Bailey’s and sat atop the complimentary chocolate cupcake sponge. Absolutely fabulous! I urge you to visit the Swallow Bakery. (Or better yet order online as they prepare x24 cupcake batches for home delivery! Wow!) For readers outside of the UK at the time of this writing: http://swallowbakery.com/pages.php?pageid=2 states: “We can ship to virtually anywhere in the World.” Double Wow!!! Though I am happy to commute an our for an afternoon in glorious Cheltenham and loose-leaf tea & cakes in this particular café. The drawbacks to this lovely place is that the cakes sit prettily with no cake stand glass lid! Argh! So if you’re lucky the cake will be fresh and moist. If you have popped in on a quieter day then with no lid covering the cake you find one slice horribly dry and unappetizing. Damn! So this lovely café receives 7/10. In my humble opinion this deserves a “very good” label.